About this time every year, Hi Knoll Park draws many visitors to see the dog-toothed violets that are on display near the main gate on 48th Avenue in Langley. I used to live a short block away from that main gate, and always kept an eye out for these special beauties. The flowers grow on long stems, with just two leaves at ground level, parallel to the ground. The curves of the petals fascinated me, so I picked a few (not supposed to) and took them home to draw. That was quite a few years ago, even before I moved to white Rock…. 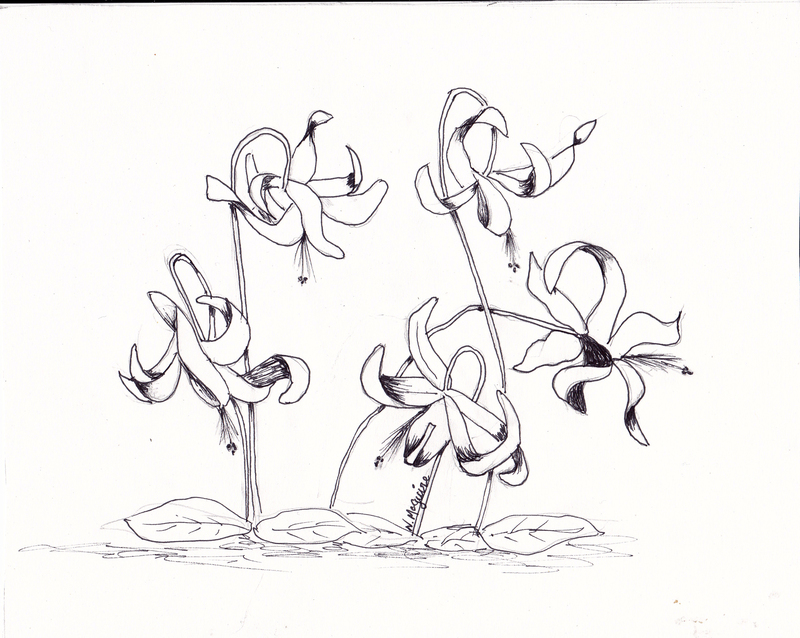 but I was thinking about them , so got out the photos and my drawings, and did another pen and ink sketch! It was always a special added treat if we found trilliums somewhere near by. My sons always warned me not to go in the park alone. NO, I won’t… but this day I wanted to see if the violets were in bloom. Just before I was to turn in at the gate a fairly large teenage boy passed me. I smiled and said hello, and he answered, and kept going. I saw him turn into a yard a couple of houses ahead. I turned into the gate and walked a ways down the hill until I got to the gorgeous flowers. Then, kind of out of the corner of my eye I saw a movement up ahead…someone cutting in from the road, and heading up my way…yes.. it was the same teenager. I KNEW I was in danger. I had to get back to the road where I came into the park, so that I was visible to anyone in the area. “Don’t go too fast or you might fall”, “ Get out of here as fast as you can!” The footing was uneven… “be careful”. I did get out to where there were cars going by, and people walking, and I was truly grateful. He turned back as soon as I got on the road. You know, I never went in that park by myself ever again!! My sons were right! What a horrific incident that was . Glad no harm came to you that day. On a lighter note I had to laugh when you mentioned trilliums . As a young child we spent a lot of time playing in the back property at Nana and Dadads place . I always loved to pick the wild flowers for Mom and one day I was told by Nana in no uncertain terms that if I picked the trilliums she would call the police and have me arrested. I can honestly tell you my Grandchildren will never share a story like that about me 🙂 I look forward to these stories so much. I loved to pick wild flowers, too… especially after a rain! That was when we lived in the caribou. I’m glad you didn’t get arrested! You have some interesting memories, too, don’t you, Kallie. I love seeing the these flowers appear because they are a sign of all the beautiful spring flowers to come. It is such a special time of year – so fresh. Your sketch is lovely! You remember that kind of fright for a long time! I’m glad the situation turned out okay. I wonder if those violets are blooming yet in the park. We don’t have any here in our woods, but we do have trilliums, although they aren’t out yet… just our snowdrops so far. Your sketch is lovely. It really captures the delicateness of the violets and their sweet nodding heads. I feel so cheated! We don’t have those lovely little violets here. I love the wild violets we do have, but have never been able to transplant one successfully. For years I’ve wanted to have a small bed of them. But they crop up, willy-nilly, in my lawn and are decimated by the mowing. Friend-husband will not mow around them. What a beautiful sketch. It so captures your dog-toothed violets adventurous spirit, waving their heads aloft. Our violets are shy and keep their heads low. How I would love to be able to accompany you on your rambles. Two are always safer than one alone. I’m so glad you are safe. Please do not take any more chances. Good Morning Norma; I am googling High Knoll Park right now to find out where it is located in relation to 48th Avenue. Always love your stories and drawings and photos. Good morning Dave. Did you find it? Turn in from 200th at 49th, and you will come to a dead end where the road turns to the left. that’s where the open gate is. Thanks to each of you for stopping by and for your comments. I’ll have to get that kettle on for your next visits..